The other day I had to do a backup of my computer – we’d had a power spike that took out the surge protectors, my backup drive, my son’s power supply, and his main hard drive. In 20 years, we’d never had power go out, so this was a first, and had us wanting to make sure we didn’t have to go through that again. It was a “not fun” few days of buying new hardware, rebuilding one machine, buying UPS’s – and fixing the backup drive, but we did it, and as is often the case with these things – it got me thinking. My computer is like a digital attic – stuff gets stored there and sometimes referenced, but honestly, often forgotten. My grampa, on the other hand, had not just a garage full, but an entire barn full of treasures – one of which was an olive drab, unused, hunk of metal, that when you looked more closely at it and did some research, was a flathead V-8 engine made by Cadillac for small tanks in World War II. (like this one). I’m sure it was plentiful in its time – but today? It was rare, but rare doesn’t necessarily mean valuable, and being in a barn, you had to go through a lot of crap to find the treasures. And the thing was – he’d collected so much stuff – treasures in their own time – that some of it, while still functional and serviceable, had gone completely out of date and become obsolete while it was being stored in that barn waiting to be used again. And the guy tried to back out a bit. 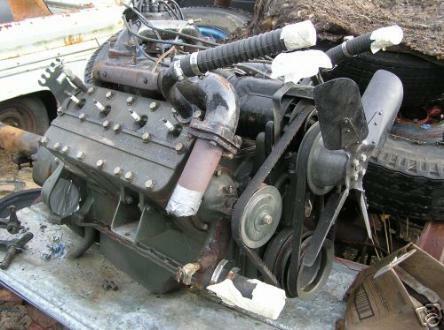 And of course, the fellow wouldn’t – so this extremely rare Cadillac Tank Engine wasn’t worth a dollar, because really, something is only worth as much as someone will pay for it, right? All I saw was treasures, at the time, but he was right. Going back to my uncle for a moment – He and I had talked about kind of a lifecycle of “stuff” – where at first you’re willing to trade something you consider valuable for it, and initially, this “stuff” gives to you… It could be something that saves you time, or makes you money, or brings you happiness or comfort, but it gives and you get something because you have it. Eventually it just becomes part of your life, and it’s pretty much been there as long as you can remember, but at some point, it stops giving, and the balance shifts, ever so slightly, and this what has given you so much over its lifetime begins to take. This goes for stuff and for things, and sometimes people and relationships in your life, and it’s a signal that it’s time to move on, or let go. Eventually, the shift is more pronounced, and just the simple act of keeping “the stuff” starts costing more money, more time, more energy, than you get out of it. But you’re used to having it, so you hold onto it. In fact, I took a step back, mentally, and realized as I was sitting there configuring the UPS’s I’d bought for my computers, backing up tens of thousands of photos, and I realized that in some ways, the shift, like the photography I’d learned years ago, was making the transition from analog to digital, that my computer was full of ones and zeroes, and it was costing money to keep them. As data professionals, we talk about how important it is to keep our data safe, and the fact is, it is important, but are we keeping too much? Just like I wondered sometimes whether it was really important for my grampa to be keeping some of the things in his barn, Is it important to keep every digital picture I ever took? If I keep them, I have to manage them, I have to make sure they’re usable, right? Here, let me throw a digital monkey wrench into the mix. You’ve all got digital cameras out there now, right? How do you handle it when you have upgrades of image processing software? The reason I ask is that a number of years ago, Microsoft made a product called ‘Picture It’ – which, for its time, was pretty good, but the problem is, none of the software that came afterwards would open the files created by this product. So now, because I have upgraded the computer and the operating system and Picture It won’t run on the new one, I have hundreds of pictures with a .mix extension that I can’t open at all unless I find a copy of Picture it 5.0. That would cost me time. A number of years ago I bought a family tree program and put a bunch of pictures in it – with all sorts of metadata in the pictures – where they were taken, and so on. Understand these were slides and prints that had been scanned, there was no GPS data embedded in the images at all. I couldn’t upgrade to the next version, and found that all the work I’d put into researching and getting information about the pictures that are part of my family tree – simple metadata about the pictures – was now useless – I couldn’t transfer it anywhere unless I bought the next version of the software. That would cost me money. And now – it brought me full circle, as I was sitting there, computers hooked into the UPS systems, backup drive slowly being filled up by backed up ones and zeroes. It had cost me both time and money. It had me asking a lot of questions, like, “When is it important to let something go?” As I was sitting there – looking around, I not only realized that I had thousands of images, some of which I hadn’t seen in years, that that needed to be backed up, but also realized that my computer had turned into a digital junk drawer. How many of you out there could raise your hand to that one? Dragging myself away from piles of floppies, CD’s, and the two Pentium boxes I finally got rid of the other day, I find myself thinking about the stuff we do at work. We have stuff that we have to keep for legal reasons, which means boxes have to run in isolation on outdated software, but we have to keep them that way, we can’t upgrade them. At least that way the data is readable, and accessible. There have been situations where people got rid of tapes of very important data only to discover that they had racks and racks of tapes they couldn’t read anymore. We keep gathering data, we keep making more databases. They keep growing. I know poor database design makes some of the databases I administer and manage daily get bigger – the growth chart of one of them looks like the flight path of a homesick angel, and it is seriously causing us some trouble. At the moment, that particular app is under discussion, but the thought of wanting to keep all the data we get, in case we need it someday (words I heard growing up many times) – is a little overwhelming. But how do we know when that someday is? I know digital storage, like real storage, initially, is cheap – but does it count the machines that need to handle the backups? The people to maintain them? The backups themselves? The offsite storage? How much will it cost us to manage what we had, at the expense of what we have?